Please be advised that CB Nexus Corp. has revised its Credit and Collection policies, including its Anti-Money Laundering Policy, in an effort to enhance credit processes, protect against fraud and to ensure compliance with global anti-money laundering regulations. 1. The preferred method of customer payments to CB Nexus Corp. is by wire transfer through the customer’s own bank account. 2. CB Nexus Corp. no longer accepts cash, money orders, or traveler’s checks. 3. 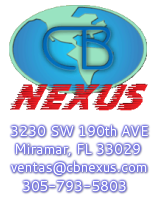 CB Nexus Corp. is actively discouraging payments by the following methods: Casa de Cambio/money remitter or exchangers, third party checks and third party wire transfers. 4. If it is necessary for CB Nexus Corp. customers to utilize a Casa de Cambio/money transmitter or exchanger, third party wire transfer or third party check, customers must provide the documentation establishing the relationship between the customer and the third party, and proof that the corresponding payment was made by the customer to the Casa de Cambio/money transmitter or exchanger. The documentation must be provided before the payment is made.